The establishment of green floating islands or filters, at commercial scale, requires large quantities of plantlets for early full vegetation cover; plant requirements are usually estimated at 20-28 plantlets per square meter, which means a supply of 28,000 plantlets for 1,000 m2 filter. Plant propagation and plantlets production should be carried out by specialized firms such as the nurseries of aquatic plants. In order to ensure the supply of plantlets for GFF establishment, the Technical University of Madrid (UPM) maintains regular contact with the plant nursey named ‘Viveros Forestales La Dehesa’, a firm that produces aquatic plants in addition to forest species. ‘Viveros Forestales La Dehesa’ is located at the municipality of Valdeobispo (40º 4’42” N; 6º 14’ 56”W), province of Caceres, Spain, and has facilities suitable for propagating Typha domingensis (cattail) at large scale. During the vegetative growth period of young cattails, maintenance tasks are carried out, including periodical trimming of cattails shoots. 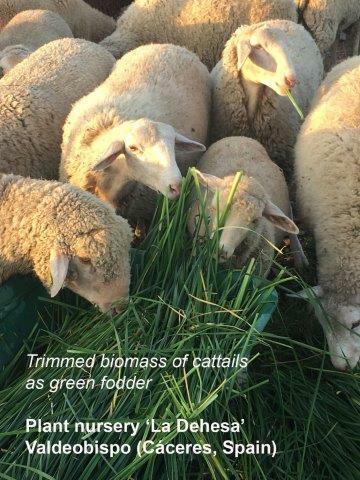 Trimming results in large amounts of waste biomass that may become a resource if it is adequately valued. 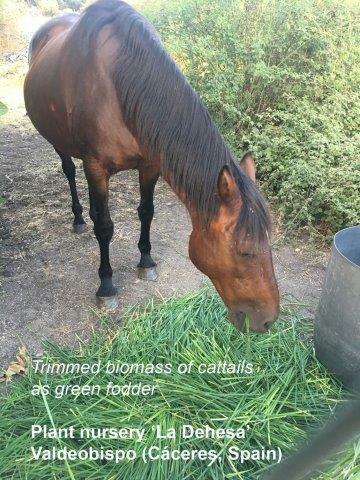 Interestingly, the entrepreneur of ‘Viveros Forestales La Dehesa’ took the initiative to test the suitability of trimmed green biomass for animal feed, experimenting with his own livestock. 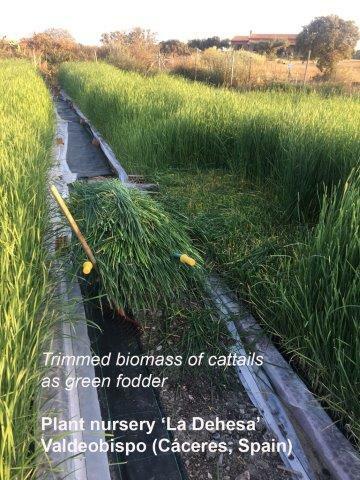 Tests succeeded; currently, on a routine basis, trimmed green biomass of cattails is used in-situ in ‘Viveros Forestales La Dehesa’ as fodder for sheep and horses.